M. Gaudreau, Soil Scientist/FSR Specialist, TRD, Inc. Trials in the Mantaro Valley, Peru. -- The 238 Jordanian farmers who were patient during our individual interviews with them early in week two, and the 94 Jordanian farmers who attended the farmer group meeting on Thursday of the field week. outstanding attitudes toward the training and, more importantly, toward the work aspects of the workshop. Their willingness to work on team and group activities was high enough to make our jobs as trainers and facilitators much easier. -- His Excellency the Minister of Agriculture Dr. A. Badran, for opening and closing the workshop; Mr. 0. Bilbeisi, Director of Projects at the National Center for Agricultural Research and Technology Transfer (NCARTT), for arranging and facilitating the opening and .closing ceremonies; and Dr. R. C. Cummings, USAID ARDO, for his timely remarks during the opening ceremony. -- The directors of the six Regional Agricultural Service Centers (RASCs), for their collaboration in the use of their facilities, staff and vehicles during the field activity week and for their assistance in working in the regional areas; and the heads of the NCARTT headquarters divisions, sections and units, for their cooperation in allowing representatives to attend the training workshop and participate in the RASC team activities. -- Mr. F. Quashir, USAID JNADP Project Officer, and Dr. R. C. Cummings); Dr. G. Rodewald, Acting Chief of Party, Jordan National Agricultural Development Project (JNADP); Dr. Y. Rushdi, Director of NCARTT; Mr. N. Katkhuda, Head, Stations and RASCs Section, for their extreme efforts in making sufficient funds and human resources to available so as to allow the training to be done in the manner most technically correct. -- JNADP support staff (S. Issa, S. Nesheiwat Rihani and Z. Abd Rabu) and NCARTT support staff (N. Al-Bana, R. Altick, K. Qutaineh and H. Qaqish) for their efforts in assisting with the logistics necessary, allowing the training to be a success. The three NCARTT/MOA drivers for devoting their services for a week of driving in the Shoubak area and to and from Mushaqar each day. -- NCARTT, the MOA and the University of Jordan (Jordan); USAID, the Consortium for International Development (CID) and Washington State University through the JNADP, and TRD, Inc. (U.S.A.), for encouraging and funding the facilitators. A Farming Systems Research Workshop was conducted at NCARTT Headquarters in Al-Baqa'a from August 5-24, 1989. The participants were NCARTT researchers and extension personnel from the Center and from each of the six RASCs. Resource persons from the University of Jordan, consultants to the Jordan National Agricultural Development Project, as well as personnel from the Monitoring and Evaluation Unit and Extension Division of NCARTT facilitated the workshop. A list of participants and resource persons is found in Appendix 1.
personnel to and further develop the understanding of all NCARTT personnel regarding the concepts and procedures of Farming Systems Research and Extension and to provide them with the skills necessary to formulate research and technology transfer workplans that are more relevant in addressing farmer specified needs. While this was a training activity, it was also a workshop, with the output being a revised workplan incorporating on-farm research and technology transfer interventions responsive to farmers' needs. 2), the participants worked in interdisciplinary teams organized byoRASC with a representative of the NCARTT Center integrated into each RASC team. The first week's activities in Amman introduced the participants to the concepts and procedures of Farming Systems Research and Extension. During the second week, the teams worked out of their respective RASCs to informally interview farmers about their crop and livestock systems, and to discuss with them the problems that limit their production. Training activities in Amman the third week were oriented toward the evaluation and interpretation of on-farm research. The teams also had time to revise their workplans using the data collected in the field. Because farmers have many constraints that are outside the domain of research and technology transfer, the participants made recommendations about agricultural policy issues that impact farmers. This report will focus on the Farming Systems Research process as it was used by the RASC teams, the outputs of the workshop, the workshop evaluation, and future training needs expressed by the participants. The participants received over forty handouts as training materials during the workshop. These handouts are incorporated as appropriate into the text of this report. the RASC and NCARTT headquarter levels. The purpose of training in FSR (Appendix 3) is to provide research and extension personnel with communication skills, analytical skills, and management skills so they can work with farmers to address their problems through appropriate research and extension interventions. Farming Systems Research has evolved in developing countries (Appendix 4) because the impact of traditional agricultural research has not reached the majority of the world's farmers. With the evolution of FSR over the past twenty years, there has been agreement on the two basic characteristics of FSR, that is interdisciplinary work and collaboration with farmers. What is the meaning of Farming Systems Research, and how will the FSR approach be defined in Jordan? WHAT IS THE MEANING OF FARMING SYSTEMS RESEARCH? (2) Describe the relationship, between researchers, extension personnel, and farmers in FSR in Jordan. WHAT IS THE MEANING OF FSR? FSR is agricultural research which involves several research disciplines, working together with technology transfer and farmers, to tailor and attend research solutions to groups of farmers who are subject to similar agronomic, ecologic and socioeconomic constraints. This meaning will vary by region here in Jordan, but the key elements of it -- interdisciplinary research, cooperation between research and extension, and including farmers as full partners in the research and technology transfer process -- must be present throughout the process whenever it is applied in the Kingdom. This interaction between researchers, extension personnel, and Jordanian farmers can best be demonstrated with a simple diagram. The following figure shows how this relationship starts out and develops over time. Notice the predominance of research at the beginning, the predominance of extension during the middle of the process, and the predominance of the farmers toward the end of the process. This indicates a natural progression in the relationship between researchers, extension personnel, and farmers. The relative roles vary by trial type, and the lines dividing the three groups are not fixed. The amount of involvement of each group with a set of on-farm trials is also flexible. However, it is generally true that at the beginning of work with any set of trials, researchers have the most to do with design, layout, monitoring, harvesting and analyzing the results. Likewise, later (during the second year, for example) extension becomes more involved in a set of trials. Finally, during the last year, or later in the process, extension passes more and more of the responsibility for trial management to farmers, thi's is indicated by the right-hand side of the figure above. In common FSR terminology, researchers are most involved in exploratory trials (year 1), technologyv transfer personnel are most involved in verification trials, and farmers are most involved in demonstration trials. As the diagram shows, however, no group is excluded at any stage of the process. The important fact of FSR is that all three groups -- researchers, technology transfer personnel, and farmers -- work together as partners across the entire process of research and technology transfer. international agricultural research centers implement FSR differently depending on the resources available and their institutional structures, there is general agreement on the key elements of the FSR process: Diagnosis and planninQ, Experimentation, Analysis, interpretation, and redesign, and Dissemination. (2) describe how FSR trials are based on a combination of socio-economic and biological factors important at the farm level. WHAT ARE THE PROCEDURES OF FSR? STAGE 1: Diagnosis and planning. and redesign of the next round of trials. Planning is included with diagnosis because the two are inseparable. During the rest of this FSR training session, diagnosis, planning and the design of on-farm (exploratory) trials take place together in what is called, the "combined sondeo". A regular sondeo, which is Spanish for "rapid reconnaissance survey", has already taken place in Jordan. The sondeo occurred during 1987.
to prioritizing researchable constraints. This identification of researchable constraints in turn will lead to the design of simple exploratory on-farm trials for 1989/90 to address some the most important of these constraints. This NCARTT/RASC research/technology transfer teamwork will also lead to a set of recommended trials for NCARTT experiment stations to address those researchable constraints which as yet have no-research solutions. Finally, the extension programs for 1989/90 will be planned for each RASC and for the Extension Division at NCARTT headquarters. The combined sondeo will be institutionalized at NCARTT. Each year, another combined sondeo will take place before the annual planning process. In this manner, each RASC and the NCARTT Section Heads will be able to update their farm-level research workplans and programs, keeping them current and assuring that they always address farmers' felt needs, problems and constraints. next year. Such analysis will be done using Analysis of Variance (ANOVA) and marginal economic analysis. Later in this FSR training, participants will be given some training in marginal economic analysis. Another training will have to be scheduled to review statistical analysis (ANOVA). Following analysis of the results of the exploratory farm trials, a repeat combined sondeo will take place at each RASC. This time, the combined sondeo team will assess the impact of their research and technology transfer programs 1989/90, including the analyses of the exploratory farm-level trials. Again, farmer opinion will be sought and used to assist researchers and technology transfer personnel fine-tune, expand, reduce, or change trials and programs. This 2nd year, verification trials will be designed. The verification trials contain less treatments than exploratory trials; but more treatments than demonstration trials. Both researchers and extension personnel are involved in the design, layout, management and analysis of these verification trials. When verification trials have produced satisfactory results, the most productive treatments in them are advanced to demonstration trials. During this year,technology transfer personnel are involved to a maximum degree, whereas researchers are less involved. More detailed information about the-plans of the NCARTT FSR approach is contained in FSR Training Document No. 1-2-9: "Where is FSR Going at NCARTT?". Appendix 5 is a set of definitions commonly used in FSR. It was handed out as reference material for the participants. agricultural production are not new to Jordan. Such activities have been conducted by the University of Jordan, ICARDA, and over the past two and one-half years, by NCARTT itself. A description of these activities is found in Appendix 6. To understand better how FSR can be institutionalized within NCARTT, there were a series of presentations discussing the functions of NCARTT, the RASCs, and Technology Transfer. The handouts from these presentations are found in Appendix 7. Since interdisciplinarity is one of the basic concepts of FSR, the participants were presented with some key points of interdisciplinary research and technology transfer. interactions among those from different disciplines who work on common tasks and come up with better results than had they worked independently. solutions to problems in tomato production in Jordan (Appendix 8). Some of the potential solutions identified were: change cropping pattern in order to increase tomato production, develop and multiply improved tomato seeds, use soil analysis results to select appropriate varieties, develop an appropriate spraying schedule. After the exercise, the participants were asked to reflect on the advantages and disadvantages of working as a member of an interdisciplinary team. The advantage cited by the participants was that they came up with better solutions more quickly. working as part of an interdisciplinary team gave them a clearer picture of the problems. They could cite no disadvantages. methodology of a National Research Program. At NCARTT, FSR/E is in the process of being institutionalized. This training workshop is an important step in that process. A strategy statement explaining how the process of FSR can be implemented at NCARTT was presented. WHERE IS FSR GOING AT NCARTT? TRAINING OBJECTIVE: When participants finish with this material, they should be able to explain briefly how FSR will be used in Jordanian agricultural research and technology transfer. Jordan: moving from where we are (the "status quo") to where we should be going. This handout presents the complete FSR approach for Jordan through NCARTT. 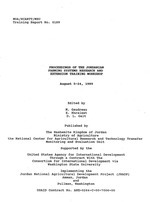 Development Project (JNADP) and NCARTT in early 1987. Training in the sondeo process was held for selected NCARTT staff in early 1988. Demonstration trials have been placed on RASC stations and in farmer's fields by several NCARTT research sections. The Monitoring and Evaluation Unit (MEU), was created by the JNADP and the GOJ and began to function at NCARTT. One of the mandates of this unit is to assist other NCARTT research sections and all RASCs implement FSR in Jordan. This handout outlines the Jordanian strategy for increasing the efficiency of FSR in research and technology transfer. It tells where Jordan will be going with the FSR approach over the next three years. It points out that the FSR approach is an asset to each section and RASC. The FSR approach must contribute positively to research sections and RASCs: if it does not, then the approach must be modified. until it does. An FSR approach adapted to Jordanian conditions will lead to improved technology from a given section or RASC which is more adapted to farmers' needs than will adherence to traditional research and technology transfer. The key to successful use of FSR is for each section and RASC to select those parts of the FSR "menu" which help most in their research programs and workplans. During this training, each section and RASC will be encouraged to "pick and choose" from a broad FSR menu those ideas and methods which are most appropriate to their unique research and technology transfer programs. The rest of this FSR training handout moves the NCARTT FSR approach along a path toward placing greater emphasis on addressing real farmer needs. This workshop is dedicated to teaching each of you how to identify and prioritize farmer systems and constraints (both include farmer needs), to determine which of these needs are appropriate for either research or technology transfer, and to design research and technology transfer programs to address these needs more realistically than in the past. Much of research and technology transfer at NCARTT can be characterized by a one-way, "top-down" flow from NCARTT to farmers (Top two arrows, FIGURE 1, part (A).) The weak or nonexistent "backward" linkage from farmers to NCARTT is shown by the broken arrow at the bottom of FIGURE 1, part (A). (B) of FIGURE 1. This stronger flow of information from farmers to NCARTT will lead to the use of more farmer needs in designing research and technology transfer programs. results of these trials are all performed by NCARTT researchers. half of FIGURE 2). However, since these are still research trials, they should be renamed to reflect their true status. together. This is not the current situation in Jordan. TOP HALF: "APPROPRIATE" "APPROPRIATE" "APPROPRIATE"
NCARTT research sections and RASCs should move toward the situation shown in the BOTTOM HALF of FIGURE 2. First, NCARTT researchers must acknowledge that all available technology may not be entirely appropriate to farmers' conditions. In addition, all necessary technology has not yet been completely developed or verified under farmers' conditions. In either case, exploratory trials, followed by verification trials, must come before demonstration trials. FIGURE 2 shows this to take three years. To move a "set" of improvements from a research station to acceptance by farmers, a minimum of three years is usually necessary. While the process may take less time, generally it takes more. However, we will present the FSR trial process as being three years in length. FIGURE 2 shows that FSR begins with the greatest amount of uncertainty during the exploratory trial phase. Exploratory trials are planned and carried out when researchers have developed improved technoloaV on-station which has yet to be tested under farmer's actual conditions. At this stage, technology is "unadapted". However, during the combined sondeo exercise, farmer's researchable constraints can be addressed by designing exploratory trials which incorporate "best guess" components of such station-developed technology. There is a large difference between the conditions under which farmers must operate their farms and those of most experiment stations. This first set of farm-level trials is called "exploratory" because the improved technology has not been verified under the biological, economic, social, and cultural conditions found on Jordanian farms. Using the term "exploratory" allows research to admit to both technology transfer personnel and farmers that such technology is "improved" only under experiment station conditions. These trials are entered into as a partnership between research, technology transfer and collaborating farmers. farmer-identified constraints. Therefore, the technology is presumed to be as low-risk and as appropriate as possible. Thus, NCARTT researchers and technology transfer staff will design exploratory trials around the major researchable farmer-identified constraints. This begins the "exploratory" phase of on-farm research. Such trials are usually researcher-managed. They consist of relatively small plots of several promising treatments. They are usually replicated at least once (for a total of two reps) per farm. A set of these trials is placed on any number of farms, but eight should be considered a minimum number. (2) other formal analyses, and (3) dialogue with farmers hosting such trials. Farmer opinions will be gathered during a follow-up sondeo which will include RASC personnel and representatives of the major NCARTT sections. The next year, the FSR approach enters the "verification"
phase with on-farm, farmer-managed trials (center section, BOTTOM HALF, FIGURE 2). These trials are designed and monitored by a combination of NCARTT researchers and technology transfer staff during the next combined sondeo. Verification trials are implemented by the technology transfer personnel of the appropriate RASCs working even more closely with farmer collaborators this year than last. It is during the verification of improved technology that technology transfer becomes the leading partner in the FSR process. Verification trials consist of an intermediate number of treatments (less than exploratory trials and more than demonstration trials), with plots of intermediate size (larger than those of exploratory trials but smaller than those of demonstration trials). Only the most promising improved technology components are kept in the trials when they move from the exploratory to the verification stage. The decisions of which treatments to keep and which to eliminate are made following the formal and informal analyses of the exploratory trials. In Jordan, such decisions will be made next year during the follow-up (recurrent) combined sondeo. The number of farms selected as hosts for these verification trials is flexible and intermediate between those used for exploration and those used for demonstration. As a general rule, aim for a minimum of 15 farmers to host verification trials. As before, these trials are formally analyzed using ANOVA. An additional formal method of analysis is added during the verification stage. This new method is marginal economic analysis. Again, farmer dialogue by way of the follow-up combined sondeo mentioned above supplements agronomic and economic evaluations. If the marginal economic analysis shows the improvement to be quite profitable, farmers should also be stating their preference for it quite strongly. This method of using recurrent combined sondeos allows all farmer reactions to improved technology to be recorded and fed back to NCARTT researchers and policy makers through technology transfer staff. Finally, during the third year, the FSR approach enters the "demonstration" phase (right-hand side, BOTTOM HALF, FIGURE 2). By this time, demonstration trials should be implemented entirely by participating farmers with assistance from the technology transfer personnel of the trial-hosting RASCs. During this final stage, individual trials consist of a few (one or two) large blocks (plots), unreplicated on many farms. While it is hard to put numbers on this stage, a minimum of 20 farms should be considered for hosting any set of demonstration trials. After this year, the improved technology is ready for a "block" program through technology transfer personnel, at either the RASC or directorate level. Having been verified and demonstrated, this set of technology is completely in the hands of farmers and technology transfer staff. researcher-implemented trials (during the exploration phase) to researcher/technology transfer-designed, technology transfer/farmer-implemented trials (during the demonstration phase) occurs over three crop years. Improved technology judged to fit most nearly the highest priority needs of a group of farmers has gradually been tested under their real farming conditions until the most risk-free and profitable treatments have emerged as those components most useful to these farmers. sectional research programs in order to incorporate more of the FSR approach into them. These seven steps are outlined below. Note that we have completed numbers one and two and are working now on number three. taken place to discuss how the FSR approach might assist each section in its research program. taken place to assure support for FSR training, both in terms of philosophy and logistics. e. the final day includes a group meeting between those participating in the combined sondeo and the farmers interviewed earlier in the week. During this meeting, the research and technology transfer staff present (1) the prioritized constraints per system to the farmers, and (2) the suggested exploratory research trials they have drafted. Farmers are encouraged to participate in the dialogue by giving their opinions and suggestions for trial refinement. interdisciplinarity, both at the RASC and NCARTT headquarters levels. In addition, such training should assist RASC directors assign duties to their staff, based on a team approach to both research and technology transfer. exploratory trials can be planned and placed with farmers around each RASC. These exploratory trials will each consist of small plots of NCARTT shelf technologies aimed at solving a specific, high priority problem, as identified by the combined sondeo carried out during the FSR training workshop in 1989. Next year, the most promising treatments from this year's exploratory trials can be advanced to verification trials. Such verification trials consist of slightly larger plots of those treatments which were superior in the exploratory trials of last year. Finally, in 1991/92, demonstration trials can evolve naturally from the verification trials, consisting of proven improved technology, larger plots (or blocks), and only one or two treatments. Responsibility for each set of trials moves gradually from research through technology transfer to the farmer-collaborators. STEP 5: The Recurrent Combined Sondeo. A combined sondeo will be carried out by NCARTT section representatives and RASC personnel at each RASC on an annual basis. This sondeo will usually take place after cereals harvest (June) but before workplans are due (August 1). The purpose of this recurrent combined sondeo is to assist both research and technology transfer-staff to refine their farm- and station-level trials and workplans for each season. statistics and a hands-on Michigan Statistics (MSTAT) computer training on design and analysis of farm. trials will be given to the biometrics and economic staff of RASCs and NCARTT sections. MSTAT is a menu-driven statistical package which includes ANOVA for any trial design type and includes modified stability analysis, marginal economic analysis, and the ability to design field book forms. STEP 7: Annual FSR Conference. An annual FSR Conference should be scheduled for Jordanian researchers and technology transfer personnel. This Conference, designed to allow FSR researchers and technology transfer personnel share professional FSR experiences, should begin next year. The FSR Conference will provide ample time for presentation of FSR results via a series of invited papers from NCARTT sections and RASC FSR staff, as well as for discussion of both specific FSR results and the general direction FSR is taking at NCARTT. trials have been extended from NCARTT headquarters to the RASCs. However, these trials are researcher-designed, researcher-implemented and researcher-managed. FSR methodology normally calls for such trials to be implemented by a combination of technology transfer and farmer collaborators. To fine-tune the FSR approach in Jordan, the Monitoring and Evaluation Unit proposes to assist NCARTT Sections move toward a series of research trials at the RASC level which will begin in an exploratory phase, proceed through verification, and end with demonstration trials. During this process, responsibility for design, implementation, monitoring, harvest, and analysis of trials will pass gradually from researchers to technology transfer agents to farmers. Feedback of farmer opinion will continuous throughout the process, and will be obtained by a series of annual combined sondeos. These combined sondeo activities also allow sections to work closely with RASC FSR research and technology transfer personnel in designing andrefining the series of exploratory-verification-demonstration trials and annual workplans. After next year, the process of FSR in NCARTT should be pretty well adapted to the unique aspects of Jordanian agriculture. The following years should see the FSR process become more and-more fine-tuned. NCARTT sections should be able to pick and choose additional FSR activities from the overall FSR menu as such activities become appropriate to the research programs of individual sections. Working relations between NCARTT headquarters and the RASCs will smooth out and solidify along the lines of more meaningful scientific research by means of greater emphasis on interdisciplinary teamwork. Working relations between traditional research and technology transfer will be strengthened, as both divisions of agricultural development learn more and more from one another. Finally, but most importantly, Jordanian farmers will be able to adopt more appropriate improved technology sooner than they do now. This latter result should in turn lead to (1) greater profits accruing to Jordanian farm families, and (2) some macroeconomic relief on Jordanian imports (in the cases of cereals and meat products) and to an increase in lucrative Jordanian agricultural exports (in the cases of vegetable and fruit products). One of the reasons that interdisciplinarity is so important in agricultural research is that 'farmers manage multiple enterprises. To understand what farmers do and why they do it, a systems Approach is needed. No one discipline contains the necessary background (knowledge and tools) to understand and deal with this complexity. Adapted from: Volume I, Unit II: Modeling the Farming System, FSSP training manuals, Gainesville, FL. TRAINING OBJECTIVE: At the end of this session, the participants will be able to understand the concept of farm as a system and be able to construct and use structural And process models to describe and analyze farmers' circumstances and decisions. To develop a research or extension program that addresses farmers' problems, it is important to know what farmers do and why they do it. Farmers in Jordan, like farmers in other parts of the world, have multiple enterprises that they manage. They therefore make choices about how to use their resources to best fulfill their goals and objectives. Since farms are composed of different components that interact, it is useful to master and apply the concept of a system to farming enterprises. In this session of the workshop, we will explore the meaning of the word system, see how it applies to farms, and learn about two types of qualitative models that can be used to describe and analyze farmers' circumstances and decisions. components. When one is changed, all the others are affected since the parts are interacting. A system has boundaries. It is, in effect, defined by the boundaries that are placed on it, so that each system is a subsystem (or part) of a larger system. Let's look at how systems are hierarchical (parts of increasingly larger systems) by using an olive tree as an example. on a micro level, the tree is composed of cells (if you are a biochemist/geneticist, you will want to-start even lower and talk of DNA molecules). Groups of cells function together as organs, for example, leaves. The leaves interacting with stems form a tree limb, and tree limbs with the trunk form the tree. Each level (cell, leaf, limb, and tree) is a system by itself but it is also a subsystem of each successive level. We arbitrarily defined the boundary of the system we wanted to describe as a single olive tree but the tree is also part of a larger system, the orchard, and the orchard is part of a farmer's total farming operation and so on. understanding what farmers do and why. Farm operations can be very complex and farmers are used to integrating information when they make management decisions. Let's look at the farm as a system. A farm is a system made up of subsystems which would include the cropping system, the animal system, and the farm family (household) or socio-economic subsystem. It functions within a community (a system itself) and is affected by environmental factors that are outside its control. The cropping system is made up of plants which use the sun, soil nutrients, and water (inputs) to produce a crop yield (output). The animal production system uses pasture, feed supplements, and water (inputs) to produce meat, animal products and manure (outputs). The farm family (household) is fed, clothed, and sheltered (inputs) and makes management decisions (output) on how best to use their resources to attain their objectives. The inputs to one subsystem may be the-outputs of another, for example, soil nutrients to crops (input) can be supplied by the manure (output) from the animal system. The inputs may also come from outside the immediate boundaries of the farm, for example, water for irrigation, or seeds and fertilizer from the market. and at least one member of the family works off-farm. In contrast is a Minnesota corn and soybean farm which is highly mechanized and produces only one crop a year. One way to describe a system and summarize its properties is to use a model. This model describes the response of sorghum production (Y kg. of sorghum) to nitrogen inputs (X = kg. of nitrogen fertilizer). It says that adding one kg. of nitrogen increases sorghum production by 5 kg. drawing your children bring home from school showing your house, family, and pets. production system but also human behavior in order to understand how farmers manage their farms. This is much more complex than modeling fertilizer response. There are two types of models which are useful in FSR: 1) the structural model and 2) the process model. Both of these models are qualitative. Given the complexity of farming systems, it is a good idea to start out with a qualitative description of the system. As more information becomes available through onfarm research and in-depth socio-economic surveys on specific topics, quantitative models such as econometrics and linear programming may be used. integration of the crop subsystem, the animal subsystem, and socio-economic subsystem including the off-farm enterprises of a farm family. The principal components include the household, crops, and animals. A structural model of a farming system in .Jordan, adapted from Mc Dowell and Hildebrand (1980), is found below. The household (farm family) is the focus of the farm unit. Emphasis is placed on labor use, the roles of crop and livestock enterprises and sources of human food, household income, and animal feed. example, the use of crops for food and construction materials by the family). Less important linkages are shown by broken arrows (for example, the contribution of forest resources to animal feed). The model represents a first step in describing the farming system. There are other activities that could be included such as off-farm activities if they are important to the functioning of the system. The linkages between each crop and animal enterprise and other parts could be drawn out instead of lumping enterprises into the two categories of crops and livestock. The structural model is important for orienting and guiding the work of the interdisciplinary team. Understanding the context within which new technologies are to be used will help the team evaluate their potential impact. For example, the model shows that crops are not only produced for food and sale, but are used for construction materials, ritual purposes, animal feed, bedding, and mulch. In assisting the farmer to increase production of grain for food and sale, the team must insure that other critical uses are not sacrificed. supply of foods at all periods of the year. other objectives are influenced by cash requirements and the level of risk that farmers can live with. These will affect the tradeoffs that farmers make in their investments: invest in production-or spend for home consumption; invest in farm or non-farm enterprises; and how they will allocate their resources among enterprises. How do physical factors such as soil, rainfall, altitude influence a farmers' management decisions? The socio-economic environment includes such factors as land tenure, household composition and labor patterns by gender and by age, markets, and access to inputs and credit. Farmers are affected by institutions outside their control such as rural development organizations and government agencies which establish agricultural policies. farmers to attain their goals and objectives. What types of land are available and how will they be used? What is the total and seasonal availability of labor? What is the composition of the labor force? Do farmers have access to cash when needed, access to machinery or draft power, access to other inputs such as seeds and chemicals? It is important to identify the constraints farmers face. season labor requirements or cash for purchasing inputs. They may be linked to environmental factors such as soil fertility, rainfall distribution and variation,"lack of markets, and land tenure issues. understanding of farmer management strategies. That is, how farmers use their resources to meet their objectives in the environment in which they live and given the constraints which they face. These strategies include selection of enterprises and their relative importance in the system as well as the cultural practices used. Often these reflect ways farmers minimize risk. practices? Farmers know a lot about their environment and their agricultural enterprises. In many instances, farmers recognize their problems and have ways, which vary in effectiveness, for dealing with these problems. Our objective is to work together with them to improve their ability to deal with their problems. Tapping their knowledge will help researchers identify evaluation criteria for screening technologies which are acceptable to farmers. Understanding the current situation is necessary before we can determine how best to modify it. The following is an example of a process model examining strategies for land preparation/planting in Middle Kirinyaga, Kenya. Objectives Environment Resources Constraints Farmer Mat. model, can aid researchers to organize what they know about farming systems and to identify areas where additional information is needed for a better understanding of the production and management decisions made by farmers. structural and process models describing farming systems found in their areas. Examples of the process models and structural models are included in this report. Objectives Environment Resources Constraints Farmer Mgt. Production Drip Irr. 10 ha. Diseases Add fert. Selling Sandy clay Insects Spray insect. Objectives Environment Resources Constraints Farmer Mcrt. As part of the workshop, the participants were to conduct a combined sondeo to determine the predominant farming systems in the area and to identify farmers' problems and constraints within priority systems. The procedure for the combined sondeo is summarized below. A diagram showing the decision making process to be followed during the combined sondeo is presented on the next page. learn as much about the area as possible from secondary sources of information. Some of the sources of information that are useful in FSR/E are described below. A more theoretical treatment is found in Appendix 9. Ia Ln~ I ~ ~ ~ ~ J a-.A "LI-g ~RW .-..
I~ ~ asJ LaI -a a. * M A2LJI I lj"
combined sondeo to get information from farmers. There are advantages to both formal and informal surveys. However, in general, to start a field program and get an overview of the area, informal surveys are preferred. WHICH TAKES SOME "DISCUSSION" WHICH TAKES SOME "DISCUSSION"
5. --EASIER TO DEVELOP "TRUST" ~DIFFICULT TO DEVELOP "TRUST"
"CULTURALLY SENSITIVE" INSTRUMENT "CULTURALLY SENSITIVE"
Interviewing skills are very important in FSR/E, because informal surveys, while appearing to be "chats" between technicians and farmers, are really directed conversations with farmers. Some techniques for interviewing farmers were presented. interviews. Later today, you will receive a general summary list of question topics. The summary list will be modified by your RASC team today, then used as a prompt to guide you in this informal interview process. The key to interviewing farmers is to make logical progress in questioning. Switch from one major topic to another as needed. Don't skip from minor point to minor point, nor from major topic to major topic back to the first major topic. Do not interrupt one another when interviewing. Avoid large groups of interviewers. Fill in information which may have been left out or skipped as the interview is winding down. Allow enough time to enter, exit, and be sociable with the farmer and/or his family. but remember the answers given by the decision maker. If the farmer-manager is a women, interview her. for the call to prayer, for example. interview, greet the farmer according to local custom. Explain your presence and the purpose of the interview as soon as possible. Accept coffee or tea if offered. 4. Most importantly, TREAT ALL FARMERS WITH RESPECT. Don't patronize farmers. Don't preach to farmers. they are your social resource! cropping pattern is wheat-fallow-wheat, isn't it?" Dinar they earned last year. combined sondeo, makes this type of questioning easy. system we would otherwise forget to ask about. that makes the topic a problem). question. What do you do? provides the general list of specific question topics for farmer interviews, the following list provides the six major areas for which information is obtained during most FSR interviews. these are often delimited by rainfall. harvest by Egyptian laborers, for example)? of crops by season or year, whichever is appropriate. immediately after the interview is over. next season. The resulting calendar provides a graphic illustration of the entire farm system for each farmer. Jordan, grapes are interplanted with olives). goats), obtain, numbers, genders, use and feed sources. died this past year? If so, what killed them? perfect interview. Likewise, no one has ever completely botched up an interview. Have confidence in yourself and your partner and things will go well. Treat farmers as you would have them treat you! - developed by each RASC team are presented below. - - - - - - - - - - - - - - - - 16. L+R-.. JA I st I UtJ I :, L..
-------------------/----- -- -- -- -- -- -- #~.
. . . . . .~.~J ..aI$J .~J *..
... . . . .5j .
. ... .. ... ... .. 78. ---------------------------------------------------------------------------- 7 -------------------------------------------------------------------------------------------- - - - - - - - - - I I a-& %& -... I I -)I a-J I S -, < ,A "
--------------------------------------------------------- - - - - - - - - - - - - - - T LA a aa _9 UaV I il..4jsla _-& "
Prior to going to the field, the participants were shown two additional tools for organizing information collected from farmers: (1) farm maps, and (2) crop calendars. An example of each is found below; the others that were distributed to the participants are in Appendix 11. After preparing the topic guidelines, mock interviews were conducted to demonstrate bad and good interviewing techniques (Appendix 12). determine the predominant farminQ systems (crop and animal) in the area and the most important problems by system. As a first step, frequencies of each can be used. Discussions based on personal experience in the field help verify or modify the impressions gained from the frequency analysis. The team then determines which problems are researchable and whether they can be solved by on-farm or on-station research. This then leads to desiQninQ draft research trials. interventions which can be added to the RASC workplan. In other cases, problems are outside the realm of both research and extension. Generally, such problems touch on policy issues. The team can make recommendations to appropriate ministries to address these policy issues. The results of this process depend on team composition. Often, the relative importance of the systems and the components within the system is determined by the disciplines and backgrounds of the researchers and extension personnel performing the task. In order to practice this new process before the field week exercise, the RASC teams completed a group exercise using a set of farm maps as the source of field level information. An example worked out prior to the workshop is found in Appendix 13, and some results of the exercise are given here. technology transfer interventions based on data collected from farmers. On-farm research is very similar to on-station research in many respects. The main differences are in the complexity of experiments and the loss of some control over non-experimental variables on farmers fields. The planning process is quite similar and is reviewed below. Stroud, Ann. 1985. On-Farm Experimentation. After identifying the major problems affecting farmers in the areas where you work, you will have established research priorities. Now it's time to think about your work program and to design the experiments that you will put on-farm. researchers have less control over what happens Particularly as farmers become more involved in the management. Therefore, wellplanned research will help you to respond to crises in the field and even avoid some of them. The objective of the experiment should answer, at least in part, the problem you have identified in the field with farmers. It should be simple and concise. one experiment cannot answer all questions. Several small, simple experiments may be better than one large one. Break a complex problem into manageable sections then put the segments back together after receiving the results. For example, this strategy may be useful in determining which parts of the wheat technology package would be acceptable to'farmers. . The objective of the experiment will determine all the other factors that will be discussed in this handout: treatment number and type-, the number of replications and sites, data requirements, plot size, management, and stage of experimentation. tested, for example, control measures against pests or weeds, an exploratory trial is indicated. Exploratory trials are also used to identify critical management factors and to better define production problems. When the objective of the experiment is to test the bestTbet technical options identified in exploratory trials, verification trials are used. Demonstration trials are used when the objective of the experiment is to determine the acceptability of the technology to farmers. The number of treatments and treatment levels will depend to a large extent on the objective of the experiment. The treatments should contribute to overcoming the identified constraints. It is important to keep on-farm experiments as simple as possible, so the number of treatments should be limited. Six treatments in a split plot design is generally considered to be as complicated as one should be in on-farm research. selecting treatments and treatment levels is : Is the technology being tested a realistic option for the farmer? For example, a full factorial fertilizer trial is not appropriate for an exploratory trial if only a certain combination fertilizer is available (unless you are doing preliminary work for the ministry to determine which fertilizersto import). standard of comparison for the other treatments. However, it is not always necessary to have a control in an exploratory experiment. There are several types of controls that can be used In on-farm research: optimum levels of the treatments, farmer's practice, current extension recommendation, and untreated (zero level). Depending on your objective, one or more of these controls can be useful for comparison of research results. A very common control to use in verification and demonstration trials is farmer practice. Most farmers are not interested in adopting a new technology if it does not outperform what they are currently doing. variables) make major contributions to the variability found in on-farm research. Variability between farms is usually greater than within a farm. A problem exists for researchers when nonexperimental variables interact with and change the treatment response. There are several ways to deal with non-experimental variables in on-farm research. one way is to stratify the research sites by factors such as soil type, rainfall, and irrigation management. This is particularly useful when a limited number of sites will be used (exploratory trials). But by the time the technology reaches the verification trial stage, it is more important that they be tested over a wide range of environments to determine their stability. In this case, researchers should monitor the plots and record differences in non-experimental variables, and describe in detail the farmers' practices. This will help in explaining the variability and will permit later stratification useful in determining extension recommendations for homogenous farming systems. Another alternative is to plan how to manage the nonexperimental variables during the trials. For example, 'it may be necessary to weed the plots of a fertilizer trial or irrigate plots that dry up. It is important to-specify the management operation, the date they are to be done (if known) and identify the person responsible. A final way of dealing with nonexperimental variables is to ensure that all plots on one farm are managed by the farmer in a similar way. That way there is no longer a distinction between the researcher's plot and the farmer's plot. This also helps to involve the farmer earlier in the on-farm research process. The number of replications used in on-farm research depends on site variability, type and complexity of the trial, management, space, type of precision wanted, and type of data needed. In general, .2-4 replications per farm are recommended for exploratory trials, 1-2 replications for verification trials, and one replication per farm for demonstration trials. important than precision between fields and replication across fields or over years should be used. Also as farmer involvement in the trial increases, the number of replicates per location should decrease. This helps keep the trial simple, manageable, and understandable. Operational size plots may not be able to be replicated because of their large size. Because on-farm research is not completely under the control of the researcher, you can expect between 20 and 30% of the plots installed to be lost and the data unavailable for statistical analysis. In planning the number of sites on which you want to install a particular trial, keep this loss in mind. As you move from exploratory trials to demonstration trials, the number of sites Vill increase while the number of replicates per site will decrease. Decisions as to the "best" design for on-farm experiments must take into account the number and nature of treatments, the availability of land suitable for the experiment on the participating farms, and the resources available. It is a basic principle that plots within blocks be as uniform as possible-with respect to slope, soil texture, weediness, plant number (except where this is an experimental variable), plant height and girth and so on. Block size (the number of plots per block) is often a major factor determining appropriate designs. Plots within blocks don't have to be contiguous (next to each other) and blocks can differ with respect to the above characteristics. research-are the randomized complete block design and the split plot. These designs can both be used for factorial arrangements of treatments. The randomized complete block design keeps variability among treatments within a block as small as possible and maximizes differences between blocks. When there is a gradient in a field, for example a fertility gradient, place the blocks across the gradient (perpendicular). Block size will depend on plot size, but the larger the block, the more likely that there will be variability within the plot that is unaccounted for. Sometimes treatment operations such as tillage or irrigation make it difficult to manage on randomly assigned plots. Split plot design facilitates plot layout and management but sacrifices precision on the treatment applied to the main plot or larger plot. Plots should be large enough to represent input use patterns and yield but not too large to impose an unreasonable burden or risk to the farmer. A rule of thumb is that the experimental area should not exceed 20% of the cropped land. In general, use of larger plots is recommended for demonstrations, operational scale testing, better farmer understanding, seed multiplication, insect trials, trees, labor measurements, and tillage operations. Smaller plots are used to explore a range of technology as in screening and levels trials. Size is determined by management type and manager resources. Many management problems are not apparent on small plots. agronomists traditionally take a lot of data on crop development from emergence to harvest. Not all of it is required to evaluate a trial particularly when the technology has reached the verification stage. At this point, sodio-economic information plays a more prominent role in data collection. minimum data set that will permit transfer of technology from one location to another with similar agro-ecological and socioeconomic characteristics. Information on plot characteristics (plot history, soil characteristics, etc. ), management aspects (dates and order of operations performed, water management, cultural practices, etc), performance aspects (yield, losses due to-pests, quality, etc. ), and socio-economic aspects (farmers' observations, characteristics of other parts of their farming system) needs to be taken. But the data should be of good quality and either contribute directly to the evaluation of the technology or to enhance your understanding of the farming system. Farmer opinions should be solicited throughout the research process. For example, you can ask farmers by what criteria they select their new varieties and incorporate these criteria into your data collection sheets. Awn length may be as important as stalk length in evaluating wheat varieties if birds are a problem in the area. farmers become increasingly involved in the management of both experimental and non-experimental variables. It is important to determine who is responsible for providing the resources used in the experiment. Does the farmer's involvement at the exploratory level include letting you use his land or must you rent it? Who provides the inputs? When equipment is involved, who provides it? The team should establish a schedule of field operations, determine what materials are needed, identify the person responsible for each operation, and establish a contingency plan particularly for such common problems as lack of rain, pest, damage, and a delay in operations. Be prepared to make compromises and be flexible. particularly transport. Transportation issues affect the technical aspects of the trials particularly site selection and numbers. Are collaborating farmers clustered in groups or are they spread out to be more representative of the various farming systems.in the area? If you make an appointment to install a trial, will the vehicles be available ? Will there be benzene? Transportation to and from the fields must be programmed into the research. If you install the trials, you should follow up on them. The team should agree on a monitoring schedule to do this. Such a schedule should consist only of vital measurements or observations.On-farm research is very rewarding but initially it requires more planning and the ability to compromise and be flexible. The extension program planning process is also important. It is reviewed here. L"A I I a" La"